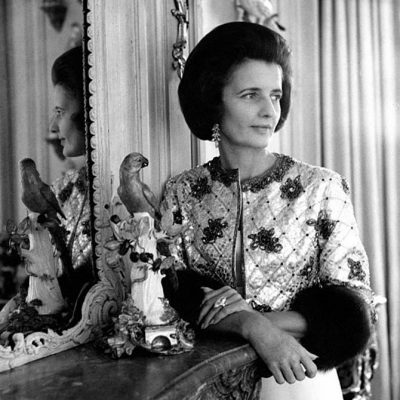 I often wonder what it would be like to have a chat with some of the great names in jewelry from the past and find out what they were really like. It’s one of the reasons I was intrigued by M.J. Rose’s new book Tiffany Blues when it landed on my desk. The novel isn’t about the Tiffany store. It’s a piece of romantic fiction with a hefty dose of jewelry intrigue set in the Jazz Age. The Tiffany in the title is Louis Comfort Tiffany. Most of the action in the book takes place at Laurelton Hall, his legendary artist colony on Long Island. When I sat down with M.J., my level of intrigue elevated to complete fascination. She told me about her process, how real jewels ignite her imagination and have been included in several of her best-selling books. 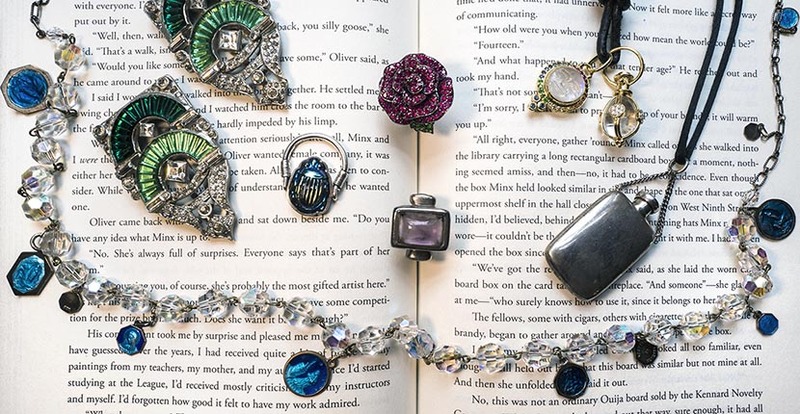 She also shared some of her favorite destinations to explore for jewelry, as well as the pieces she has acquired in connection to her novels. 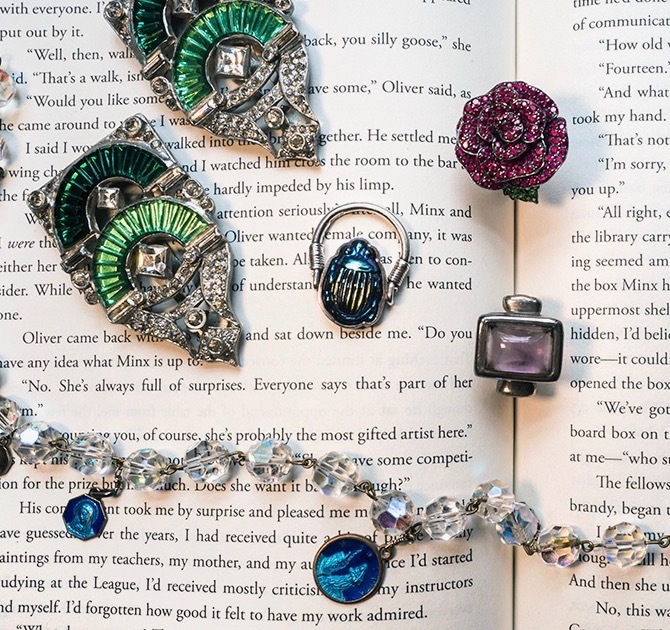 When did you begin making jewelry part of the story in your books? When I started to write a novel in 1990, I was a total neophyte and had no idea how to create a whole and complete character. Through trial and error, I developed a method including what I call “shopping for my character,” figuring out everything about her style. For that first novel, Lip Service, I bought my main character’s engagement ring in paste diamond and ruby and put it on thinking it would connect me to her. And it did. It was magic. The ring worked like a talisman. I’d get stuck and look down at the ring and feel like she was part of me and would go back to figuring out the story. I think that’s connected to my great-grandmother being a psychic and self-proclaimed witch. While I’m neither, I do think that I’m not writing these books completely on my own but that I’m picking up on psychic energy of people who have lived before and through these objects I’m channeling something of them. 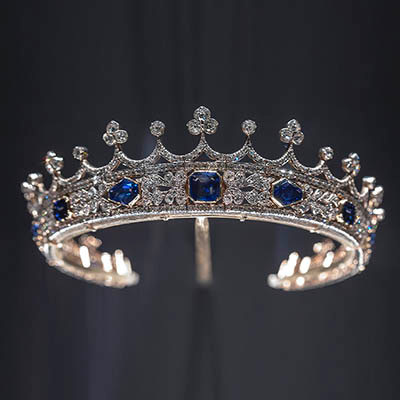 What research have you done to learn about jewelry and jewelry history ? I’ve got an extensive library of books about gems and jewelry. I’ve talked to more jewelers than I can count. And I’ve been taking classes for years —among them almost a dozen classes at L’Ecole, the Van Cleef & Arpels jewelry school in Paris. What are a few of your favorite places you like to browse and buy jewelry? My latest acquisition is a rose ring from Lydia Courteille. I always stop in her tiny, magical store whenever I go to Paris. For 7 years, I tried on that ring every time I visited, falling more and more in love with it each time. But I couldn’t justify buying it. And then in 2017, as I was looking at it on my hand I had a sense of another woman wearing it, in a very different setting a very long time ago. It’s a very modern looking piece but I imagined an avant-garde jeweler in the 1900s creating it for a woman he loved — a rose that would never decay, but always be in bloom, as a symbol of his feelings for her. And that was that! A few other places on my long list include, the Paris flea market and the U.S. Antique Show in New York. 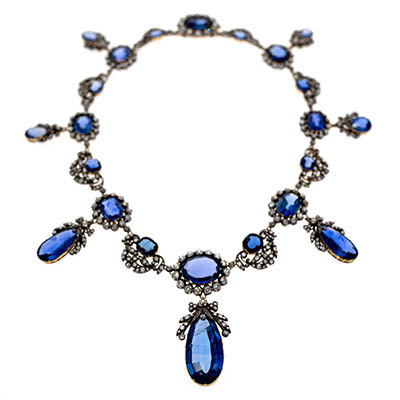 I like to look at jewelry at Sotheby’s, Christie’s, 1st Dibs and Ebay. I scroll through Instagram to see various jewelers accounts. In Greenwich, Connecticut I enjoy the estate section at Betteridge. In New York I like the Macklowe Gallery, FD Gallery, Historical Designs/HD at the Carlyle Hotel and DK Bressler. Tell me about some of your jewelry that is your books. Let’s start with Tiffany Blues and your Favrile glass scarab ring. The main character in the book, Jenny Bell, saw her first Louis Comfort Tiffany window as a young girl in 1914 and was mesmerized by it. In the early 1920s when she moved to New York City she visited his store on Broadway and was taken by everything she saw from the jewelry to the lamps, windows and objects d’art. In 1924, Jenny is accepted into Tiffany’s summer art colony at Laurelton Hall in Long Island. 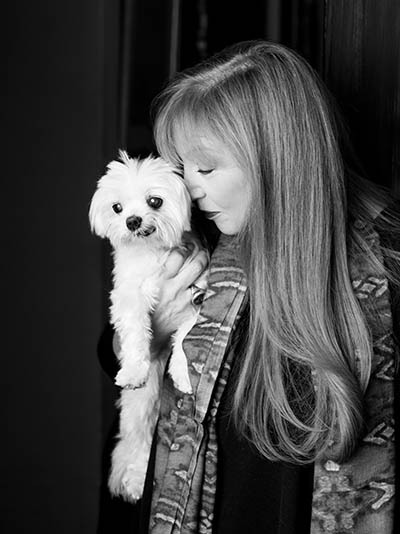 There Tiffany himself mentored her and changed her life. Once I knew the bare bones of that story, I knew I had to have a piece of jewelry that had come directly from Tiffany’s Broadway store around the time. Magically I found that ring on eBay at a price that was in my budget. The Favrile glass scarabs he made came in red or blue. I thought it was kismet that the one I found was blue to go so perfectly with the title. For The Secret Language of Stones you acquired a trench watch and an iconic amulet from Temple St. Clair. What was the connection? Nestled within Paris’s historic Palais Royal, I imagined a unique jewelry store. La Fantasie Russie, owned by a protégé of Faberge. It was known by the city’s fashion elite as the place to find the rarest of gemstones and the most unique designs. But the war had transformed Paris from a city of style and romance to a place of fear and mourning. In the summer of 1918, places where lovers used to walk, widows wander alone. It was from La Fantasie Russie’s workshop that a young, ambitious woman, Opaline Duplessi spent her time making trench watches for soldiers at the front. This required creating gold or silver cages to fit over wristwatch faces to protect the glass from being destroyed in the trenches. Opaline also specialized in her brand of mourning jewelry for the mothers, wives, and lovers of those who have fallen — jewelry that is very special. In my mind, it was inspired by both an Etruscan crystal orb I had been looking at in The Metropolitan Museum of Art for years, as well Temple St. Claire’s amulets. Opaline had a rare gift: a form of lithomancy that allows her to translate the energy emanating from stones. Certain gemstones, combined with a personal item, such as a lock of hair, enable her to receive messages from beyond the grave. In her mind, she is no mystic, but merely a messenger, giving voice to soldiers who died before they were able to properly express themselves to loved ones. 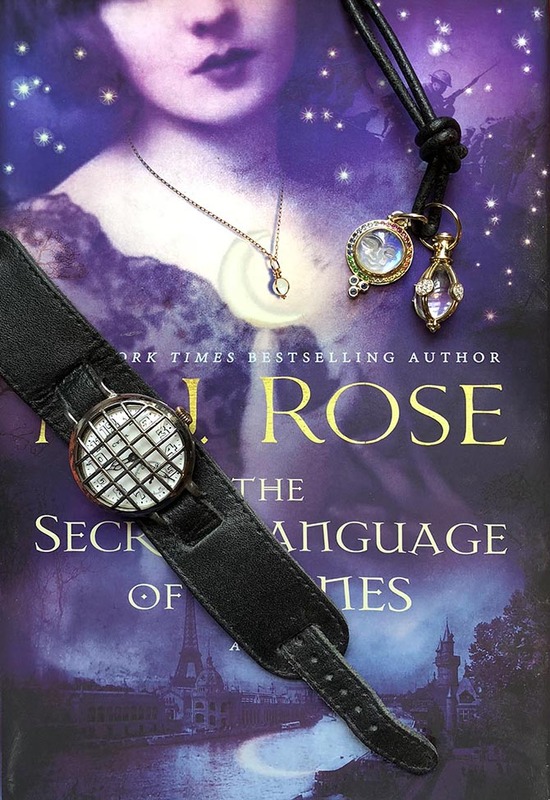 In order to “find” Opaline I bought a trench watch at the Pier show in New York City and a Temple St. Clair amulet from Betteridge Estate and wore both every day that I worked on the book. 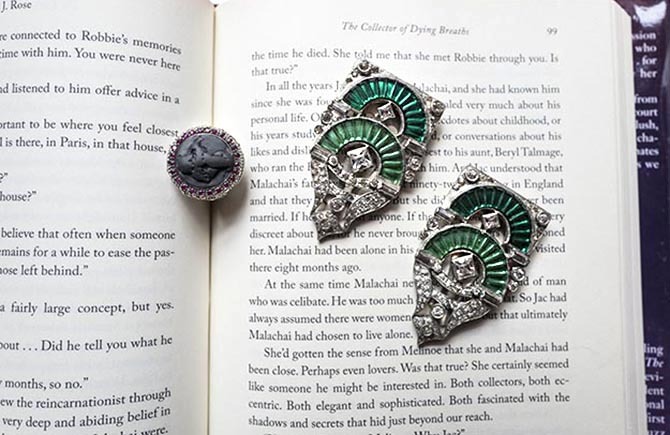 How do you Art Deco clips fit into the story of The Collector of Dying Breaths? This novel crisscrosses history. In Paris, in the present, renowned mythologist, Jac L’Etoile, attempts to recover from personal heartache by throwing herself into her work. In the process she learns of Catherine de Medici’s perfumer, René le Florentin, said to have been working on an elixir that would unlock the secret to immortality. Doing research on the 16th century perfumer, Jac confronts an eccentric heiress in possession of a world-class art collection. Melinoe Cypros who lives in Barbizon, France collects everything from ancient perfume bottles to paintings, books and of course, jewelry. 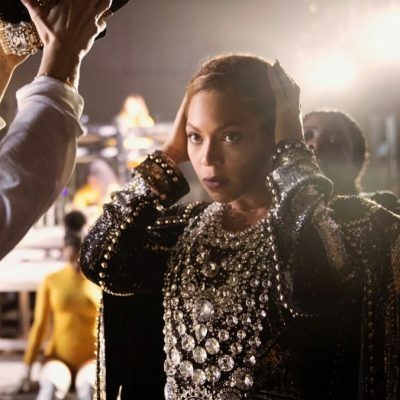 I found the paste clips in a vintage store in Paris when I was there researching the book, knowing they were something Melinoe would own, but hers would have been real diamonds and emeralds made in the ‘30s by Cartier. I had a harder time wearing them than a lot of the other pieces. They’re a little over the top for black turtleneck and leggings and ballet slippers which is my uniform when I’m writing. Just the title of The Witch of Painted Sorrows matches your volcanic ash ring by Amedeo. Tell me about it. This book takes place during the Belle Époque when New York socialite Sandrine Salome flees an abusive husband for her grandmother’s Paris mansion. What she finds there is even more menacing. The house is closed and under renovation. Her grandmother insists it’s too dangerous to visit but Sandrine defies her. She’s overcome by the spirit of La Lune, a witch, a legendary sixteenth-century courtesan, and an unsung artist, who exposes Sandrine to a darkness that could be a gift or a curse. I wanted to have something that would connect me to that ancient witch and spent days wandering around antique stores looking but nothing fit. Then one day, after lunch with a friend we walked down Lexington Avenue in New York City to Amedeo’s shop to look at some earrings. We went in and I saw the ring — a cherub carved out of ancient volcanic ash. In my notes for the book, the name I’d given the witch La Lune’s lover — the man who taught her how to paint — was Cherubino Cellini. It seemed like a sign and I bought it on the spot.